Debras Random Rambles: Christmas: A Gift For Every Heart Book Review & Giveaway! Christmas: A Gift For Every Heart Book Review & Giveaway! 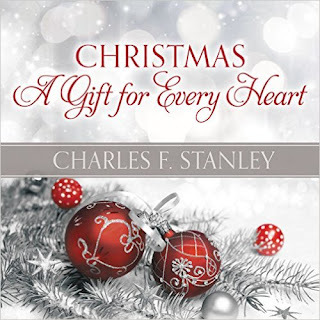 In his first ever Christmas book, beloved pastor Dr. Charles Stanley takes us back to our truest and best reason for celebration the birth of the Christ child. By revisiting the people and events of that first Christmas, Dr. Stanley reveals the unique lessons that long ago starry night offers to each of us still today. Such timeless truths as True peace and joy are found only in Christ, not in the things of this world; Christmas itself is undeniable evidence that God always keeps His promises; The Lord God not only lives and reigns, but He is intimately involved in every circumstance of our lives; and The perfect gift for us to give Jesus is the gift of our own heart. Filled with Scriptures, insights, and Dr. Stanley's own personal thoughts and memories, Christmas: A Gift for Every Heart is a treasure you'll want to open again and again. This is such a sweet and beautiful book. Each chapter ends with a beautiful writing of a Christmas Carol. My personal favorite is When You Must Wait. The quote: Christmas is gloriously undeniable evidence that, no matter how long the delay, God always keeps His promises. Look how long it took him to keep the promise of sending The Messiah. He did. In his time. A promise fufilled! Amazing! The cover attracts you with a beautiful Silver and White theme with Red Christmas Ornaments outline with silver raised glitter. It is a beautiful cover! Each chapter has a different color theme and decorated to reflect that theme. 7. Living Out Your "Thank You"
My favorite Christmas song is "Oh Holy Night." I love so many of those classic holiday tunes! My favorite is probably We Need a Little Christmas! My favorite holiday song is Silent Night. I remember hearing my dad singing it on Christmas Eve in church. The Christmas Shoes is my favorite song.